One St. Charles homeowner finds peace by honoring a love one's splendid life with a throughfully curated display of eclectic furnishings from, literally, the world over. 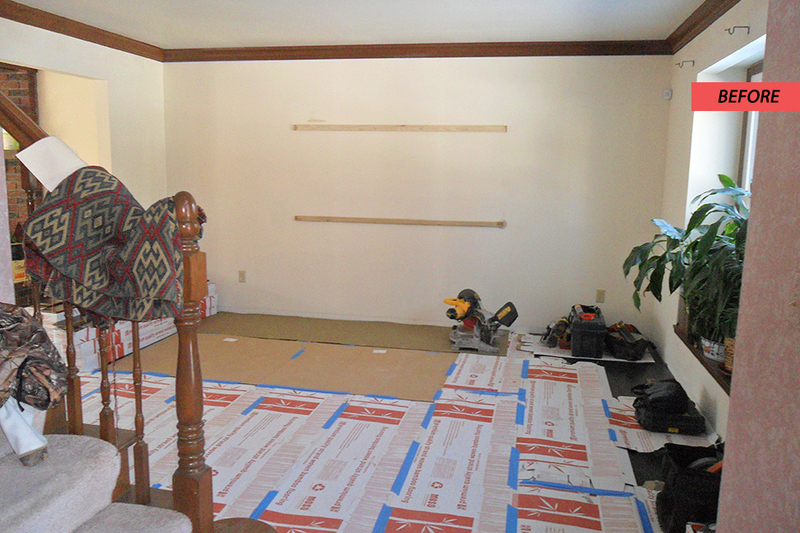 A year after her husband’s death, Jacquelynn Richmond decided it was time to carry out the couple’s plan to install hardwood floors throughout the main level of their family home. 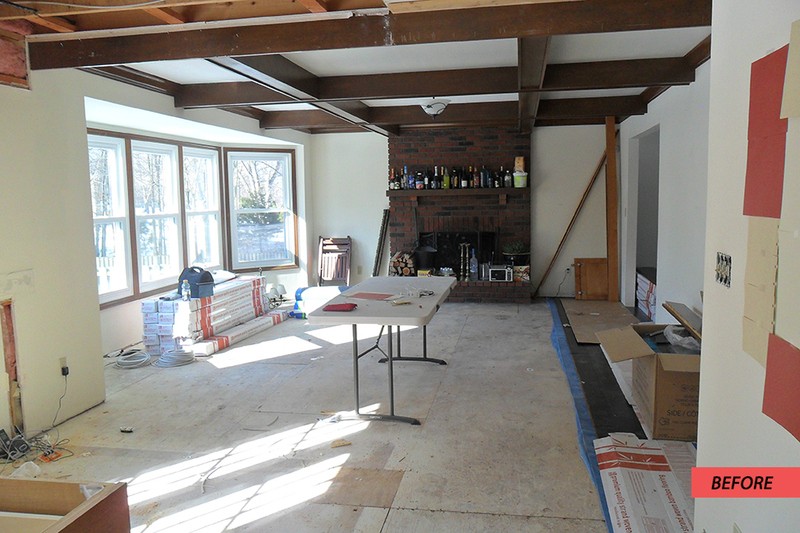 Trading carpet and vinyl for bamboo was fairly straightforward — but, given the kitchen’s configuration, replacing the floors ultimately meant remodeling the entire kitchen, which hadn’t been touched since the ‘80s and had the ubiquitous built-in desk to prove it. 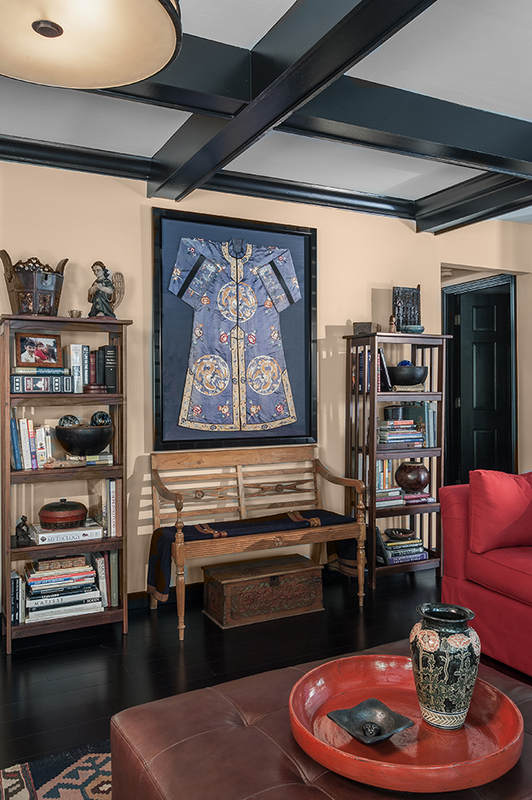 Richmond and her youngest daughter removed the desk themselves, and Richmond stumbled upon an antique Chinese kitchen cabinet with serrated doors that fit the space perfectly. That cabinet would eventually influence the rest of the Chinese-and-Japanese kitchen, with its brandy-colored RSI Kitchen & Bath cabinets and wild sea green island countertop from StoneTrends. 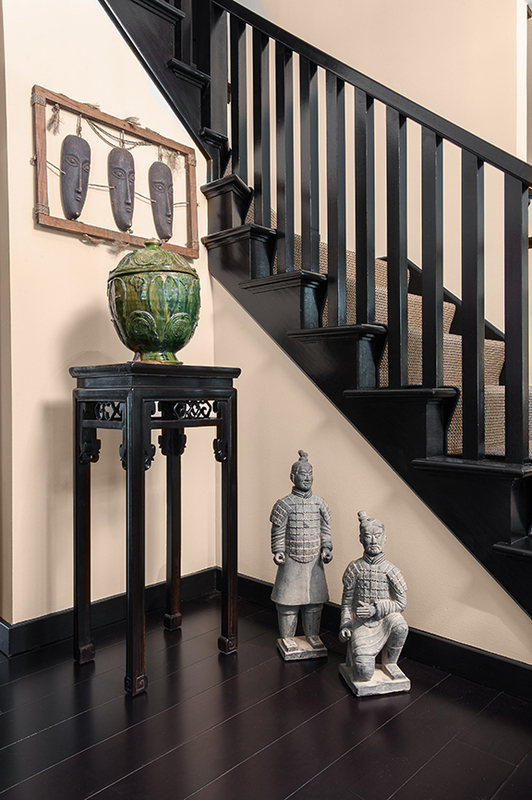 The space was designer Joyce Mathis’s first attempt at Asian kitchen aesthetic, and she nailed it by integrating a misty, glass subway tile backsplash and solid black perimeter countertops, which, along with black trim on the custom cabinet doors, incited the idea for painting all of the first floor’s trim satin black. 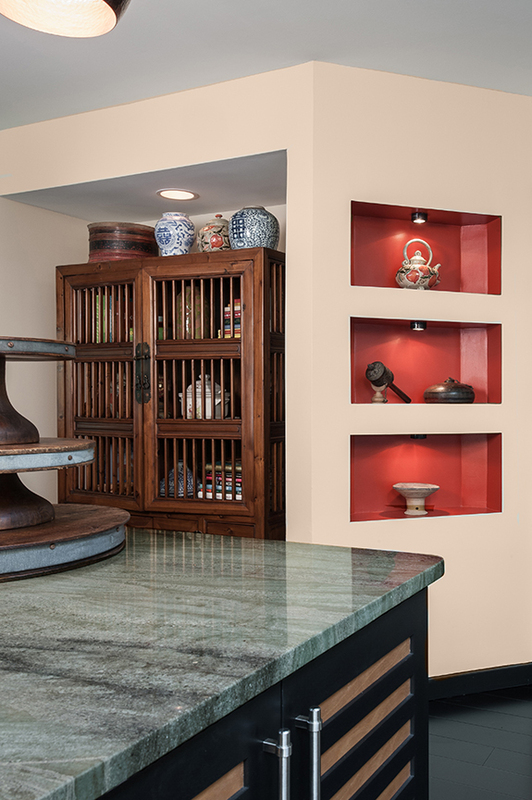 While the home’s general palette is peaceful, bold Chinese red inset shelves give the kitchen extra umph. “I never would have done that on my own, but I’m trying to move forward and be brave,” Richmond explains. You’ll notice that same energetic red in matching reupholstered cotton couches in the family and living rooms, where global design predominates. 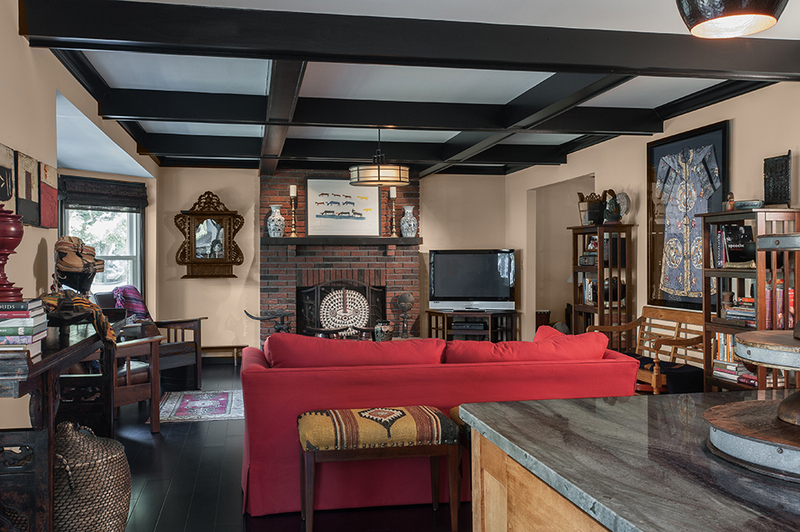 What makes Jacquelynn Richmond’s craftsman-style home special is the décor, says Mathis. Decades of travel and a deep appreciation for art left Richmond and her late husband with a distinguished collection. So, when it was time to arrange Richmond’s effects, Mathis thought: Why not treat these collectables like the museum-worthy pieces they are? 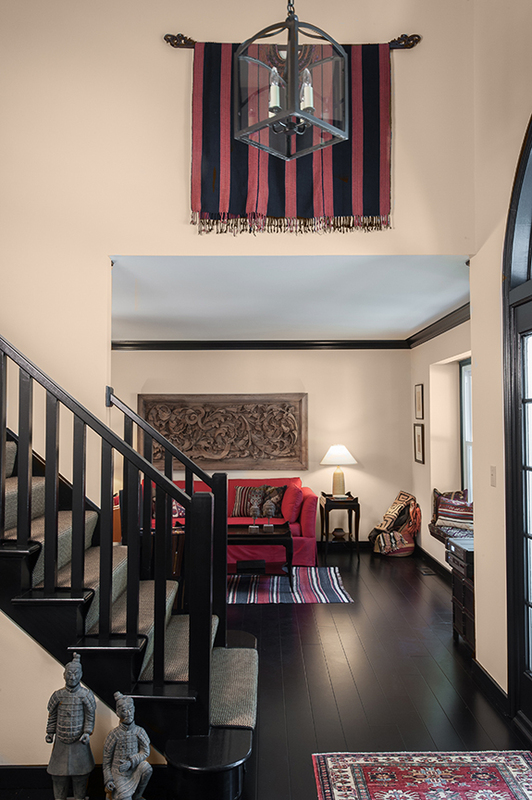 After splashing Irish Cream paint on the walls – the color’s flush tone jived with the kitchen cabinets and widespread red hues – Mathis brought on former supervisor of installation and packing for the Saint Louis Art Museum Daryl McAdoo to curate Richmond’s home. Beyond a custom-framed kimono nestled perfectly between two bookcases and a sun mask from Burkina Faso, Africa, Richmond’s family room draws on Spanish and southwestern charm: an antique Indo-Portuguese rosewood altar salvaged from a temple on the west coast of India and sourced through Neiman Marcus, and – Mathis’s favorite accent – five wood blocks from the rebellious Fr. Bill Moore’s Sunbaked series, acquired through Galerie Zuger in Santa Fe. Moore, Richmond explains, refused to give up painting when he joined the seminary, and somehow finagled his way into the priesthood anyway. The living room is similarly remarkable, with a vintage Kilum rug Richmond’s late husband purchased in Afghanistan, an inspired grouping of Indonesian and West African masks positioned aside a rope-tuned African hand drum – a Djembe – and an Irish frame drum Richmond noticed while roaming Ireland. Most special, though, is an occasional chair reupholstered with a handmade blanket Richmond and her husband snagged from a mountain town market on their honeymoon in Quetzaltenango, Guatemala. Those bench cushions on the window seat were also covered with textiles from that region — specifically, from a women’s co-operative called TRAMA Textiles. Rounding out the space are Guatemalan nativity figures, a Kilim saddlebag hanging from an antique Windsor rocking chair and a massive Indonesian replica wood piece that’s so substantial it’s bolted to the wall behind the couch. Drumming continues into the dining room — here, it’s a red hand-painted Taos Pueblo tribe drum depicting the Deer Dance. A lovely, dark dining table and classic chairs from Dau Home Furnishings offset polished silver goblets from the mid-1800s. 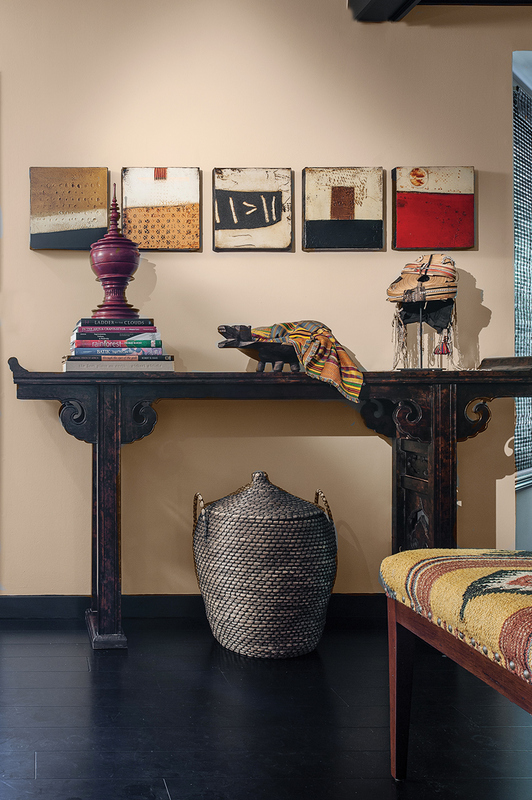 “Mixing materials,” explains Mathis, “allowed us to pull of this unique, blended look.” As far as the designer’s concerned, “The more materials you can add to a space like this, the better. 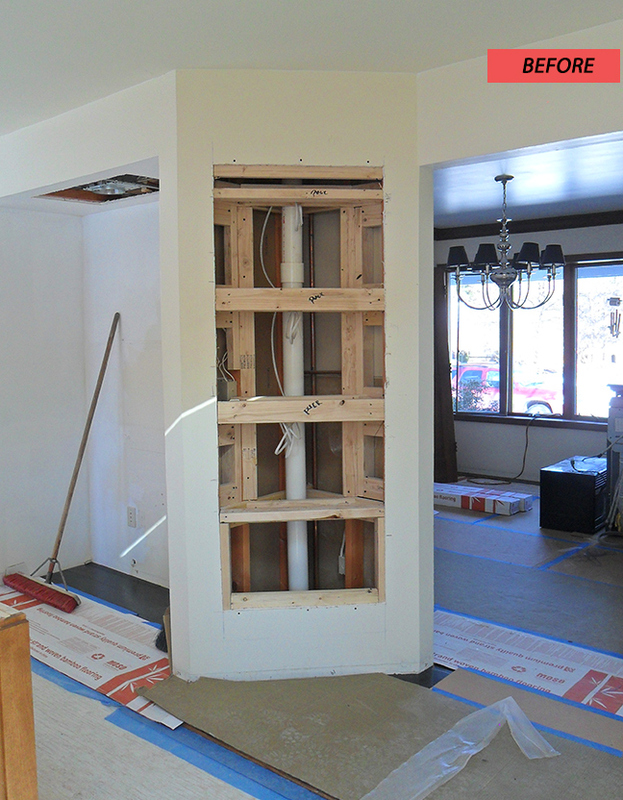 Every wall in this house is unexpected,” she says. And, it’s that element of surprise – coupled with rich, authentic history – that makes Richmond’s guests swoon. 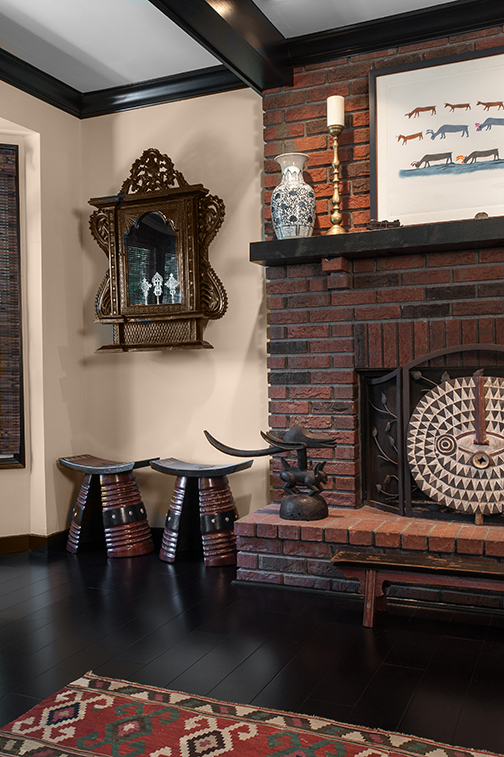 The last glance before parting is of the entryway’s Indonesian cabinet housing a Lanna Thai spirit house — a reproduction of the sort of small Thai temple you’d stumble upon in the Tibetan countryside. “People use these temples as spiritual places in their homes,” Richmond says, knowing even when it’s time to move forward, a well-lived past is never forgotten.